Needles/Hooks Suggested: Size 4 (3.5mm) 24" circs or longer, 40" or longer circs for Magic Loop; Neeldes one size smaller than used for gauge. 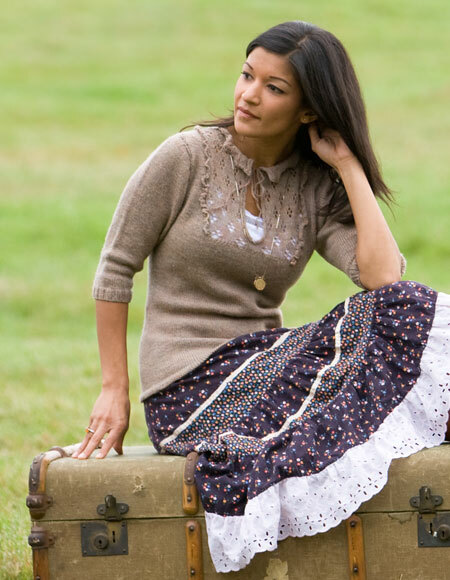 This delicate blouse invokes the quaint and simple charm of the prairie. Featuring a lace placket with ruffle edging, a keyhole opening that ties together, and ever so slightly puffed sleeves, the Lace Bib Blouse encapsulates the nuances of feminine design details flawlessly. This pattern is knit in the round and features a hemmed edge using a provisional cast on. Shown in Shadow in Oregon Coast Heather. Needles: Size 4 (3.5mm) 24" circs or longer, 40" or longer circs for Magic Loop; Neeldes one size smaller than used for gauge.